Eritrea is located at the northern part of the Horn of Africa, Eritrea shares a border with Sudan, Ethiopia and Djibouti and has a landmass area of, about 125,700 km2 inclusive of the islands, and a coastline spanning some 1,720 kilometres. Eritrea is amongst the poorest countries in the world, confirmed by its Human Development Index rank of 157 from 177 countries. Approximately 3.5 million people reside in Eritrea, with the majority of the population living in the cooler areas of the central highlands (MLWE, 2007). Its terrain extends from highlands in the country’s central and northern regions, to flat coastal plains in the eastern lowlands, and to flat plains of the western lowlands (MLWE, 2007). Eritrea also has jurisdiction over about 300 islands located in the Red Sea. No rivers flow throughout the year in Eritrea (USDS, 2011). Two-thirds of the 3.66 million population live in rural and semi-rural areas. Approximately 80 per cent of the population lives in rural areas and depends on subsistence rain-fed agriculture for their livelihoods, including both crop production and livestock (MLWE, 2007). Agriculture, fisheries, industries, tourism and mining are important parts of the country’s economy (MLWE, 2007). In 2007, agriculture accounted for 21 per cent of Gross Domestic Product (GDP); industry accounted for 22 per cent of GDP, and the service sector 58 per cent (MLWE, 2007). With a level of Gross National Income of US$640 per capita107 (USDS, 2011), Eritrea is considered to be amount the least developed countries in the world. Eritrea is one of the most food insecure countries in sub-Saharan Africa and has one of the highest rates of malnutrition; the country also imports roughly half of the food required to meet basic needs (MA, 2010). War and frequent drought, combined with population growth, have reduced food production and investment in development. Eritrea faces severe and acute vulnerability including Africa’s highest level of food insecurity and extreme malnutrition. Climatic risks pose a serious challenge to Eritrea’s emerging development priorites for agricultural development, livestock raising, forestry conservation, water resource management, coastal and marine environmental protection and safeguarding public health. 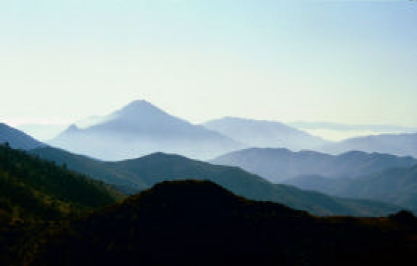 For each of these sectors, adaptation options have been identified on the basis of desk-based assessments coupled with ground-truthing through extensive stakeholder consultations, including individuals from governmental agencies, non-governmental organizations, and grass roots communities across the country. Pastoralists are among the most vulnerable communities. Over the years, pastoralists have evolved a production system that adapts to the fluctuations in feed and water supply availability. The major river basins and the areas with relatively higher rainfall and soil fertility of the rangelands serve as the dry season camp, while the open grazing land of the drier areas form the wet season camp. This traditional coping practice has been disturbed by a number of factors, including increasing conflicting land use pressures, land degradation, and newly established Government policies, e.g. on settling mobile people. 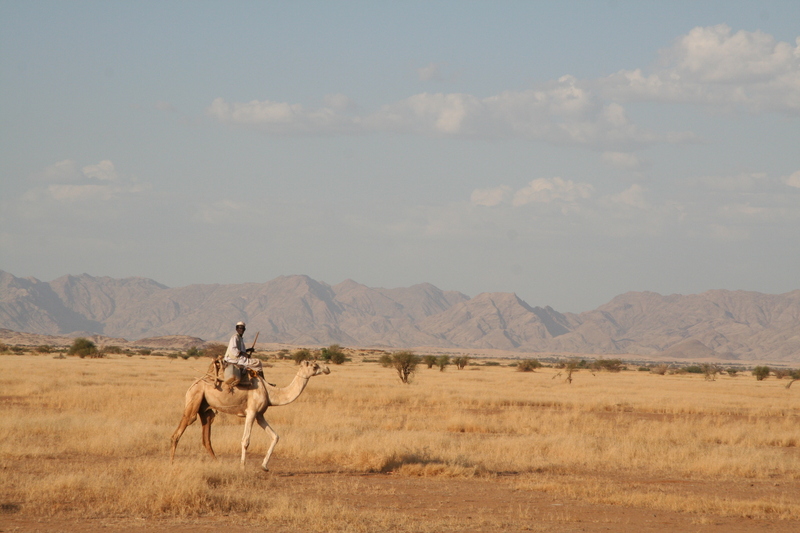 The Tsilima Region – part of the densely populated Central Highlands agro-ecological zone – is known for its agricultural products, such as sorghum and barley, it is considered the breadbasket of Eritrea, and is the focus of the government’s current and future investments in food security. Being densely populated, the region’s ecosystems and natural resources face increasing pressure. In addition to this, climate change poses an additional threat to ecosystem goods and services – and therefore agricultural productivity and community livelihoods – in this area. Like many parts of the Africa, Eritrea, being located in the Horn of Africa, is currently facing climate change-induced threats to ecosystem services and agricultural productivity, and these are compounded by the impacts of signicant land degradation occurring in the country. In the Tsilima Region, these problems manifest through reduced groundwater recharge, which affects agricultural productivity. This is partly a result of decreased precipitation, shorter and more intense rainy seasons, which reduce the potential for infiltration, promotes run-off, and increased temperatures that promote evapotranspiration. It is also a result of over-abstration of groundwater within short periods, reducing the opportunities for natural recharge of groundwater aquifers and deforestation, leading to reduced capacity of soils to retain moisture and nutrients. The project’s objective is therefore to integrate adaptation measures into ecosystem management and restoration and agricultural production systems to secure the benefits of the National Food Security Strategy (NFSS) and Integrated Water Resources Management (IWRM) Action Plan. By doing so, the LDCF-financed project will support the implementation of Priorities 3, 4 and 5 of Eritrea’s National Adaptation Programme of Action (NAPA) – which focus on livestock, forestry and water resources respectively. Furthermore, the project will mitigate the effects of floods and droughts, contribute to reduced soil erosion and increase soil fertility. Communities in the Tsilima Region will therefore be less vulnerable to the effects of climate change. The project will achieve this by enhancing the scientific and technical capacity of government staff – at national, Zoba and sub-Zoba levels – as well as academic and research institutions to identify, plan and implement climate change adaptation (CCA) interventions. This will facilitate the implementation of an ecosystem-based approach to CCA in sub-Zoba Dbarwa, in the Tsilima plains and upper catchments. The theory of change adopted for this LDCF-financed project comprises addressing the barriers discussed below and in Section II (Development Challenge) of the Project Document while contributing to the preferred solution discussed below through the delivery of three interrelated components. 1.1 Capacity of research institutions to undertake climate related research increased by over 50% as measured by changes in UNDP Capacity Scorecard. 1.2: Capacity of extension service institutions to provide knowledge based climate smart extension service to agriculture, livestock production and water management increased by over 50% as measured by changes in UNDP Capacity Scorecard: Collectively, outcome a and 2 above lead to: i) increased use of climate risk information in decisions related to the implementation of the IWRM action plans and increasing food production in ; ii) an improved score on the Vulnerability and risk perception index, disaggregated by gender (baselines at ppg); iii) Five comprehensive landscape adaptation plans formulated using the information generated under this component, complemented by community based resilience assessments. 2.2: By 2018, the amount of water available for irrigation increases by 30% over current baseline (of 28 million cubic meters) increasing the area under irrigation from 400ha to about 1000ha); baseline and target to be confirmed in PPG. In Eritrea, a small country in the Horn of Africa, land rehabilitation combats erosion and desertification, and helps restore agricultural productivity. The central highlands region of Eritrea, a densely populated agro-ecological zone, is largely considered as the ‘breadbasket’ of the country, and is the focus of the government’s current and future investments in food security. But the breadbasket has, over the years, been growing ever-emptier. Despite the relatively fertile soils, agricultural productivity had progressively declined as a result of increasing population pressure, unsustainable land and water use, and the effects of climate change (less rain, falling in shorter and more intense rainy seasons and resulting in increased run-off). This project integrates adaptation measures into ecosystem management and restoration of agricultural production systems to secure the benefits of the National Food Security Strategy (NFSS) and Integrated Water Resources Management (IWRM) Action Plan. This will support Priorities 3, 4 and 5 of Eritrea's National Adaptation Programme of Action (NAPA), which focuses on livestock, forestry and water resources respectively. Outcome 1.1: Capacity of research institutions to undertake climate-related research increased. Outcome 1.2: Capacity of extension service institutions to provide knowledge-based climate-smart extension services to agriculture, livestock production and water management increased. Outcome 2.1: Climate-resilient land use planning implemented over 9,000 hectares of the Tsilima Region. Outcome 2.2: Integrated water management operationalised across the Tsilima Region, increasing water availability and land under irrigation. Outcome 2.3: Increased food production through the implementation of climate-smart agricultural practices across the Tsilima Region. Outcome 3.1: Increased monitoring, knowledge-sharing and awareness at Zoba, sub-Zoba, Kebabi and community levels on: i) climate change risks; ii) climate- and ecosystem-smart watershed restoration; iii) climate-smart agricultural technologies and measures; and iv) the sustainable use and management of natural resources. Existing CBOs strengthened, including inter alia Village Agricultural Committees, Water User Associations and Farmer Associations to coordinate local level participation in climate change adaptation, land use and development planning. Local communities and households trained to undertake sustainable water use and management, including inter alia water harvesting, construction and maintenance of hard and soft engineering interventions. ABSTRACT: Low agricultural productivity and land degradation have become major features of the Anseba region. Over the last three decades, the region has experienced several droughts as well as erratically distributed rains. Other problems include cultivation of marginal land without fallowing, over-grazing, and inappropriate land management, lack of investment in land improvement, inadequate animal feed, depletion of underground water and the natural limitations of the rugged topography. Climatic risks pose a serious challenge to Eritrea’s emerging development priorites for agricultural development, livestock raising, forestry conservation, water resource management, coastal and marine environmental protection and safeguarding public health. Pastoralists are among the most vulnerable communities. Traditional practices have been disturbed by a number of factors, including increasing conflict over land use, population pressures, land degradation, and newly established Government policies, e.g. on settling mobile people. To view progress on Eritrea's SNC click here. Eritrea is located at the northern part of the Horn of Africa, sharing a border with Sudan, Ethiopia and Djibouti and possesses a landmass area of approximately 125,700 km2 with a coastline spanning some 1,720 kilometres. Eritrea is amongst the poorest countries in the world, confirmed by its Human Development Index rank at 157 of 177 countries. Approximately 3.66 million people reside in Eritrea, with the majority of the population living in the cooler areas of the central highlands (MLWE, 2007). Its terrain extends from highlands in the country’s central and northern regions, to flat coastal plains in the eastern lowlands, and to flat plains of the western lowlands (MLWE, 2007). Eritrea also has jurisdiction over approximately 300 islands located in the Red Sea. No rivers flow throughout the year in Eritrea (USDS, 2011). Two-thirds of the population live in rural and semi-rural areas, depending on subsistence rain-fed agriculture for their livelihoods, including both crop production and livestock (MLWE, 2007). Agriculture, fisheries, industries, tourism and mining are important parts of the country’s economy (MLWE, 2007). In 2007, agriculture accounted for 21 per cent of Gross Domestic Product (GDP); industry accounted for 22 per cent of GDP, and the service sector 58 per cent (MLWE, 2007). With a level of Gross National Income of US$640 per capita107 (USDS, 2011), Eritrea is considered to be amount the least developed countries in the world. Eritrea is one of the most food insecure countries in sub-Saharan Africa and has one of the highest rates of malnutrition; the country also imports roughly half of the food required to meet basic needs (MA, 2010). War and frequent drought, combined with population growth, have reduced food production and investment in development. Eritrea faces severe and acute vulnerability including Africa’s highest level of food insecurity and extreme malnutrition. 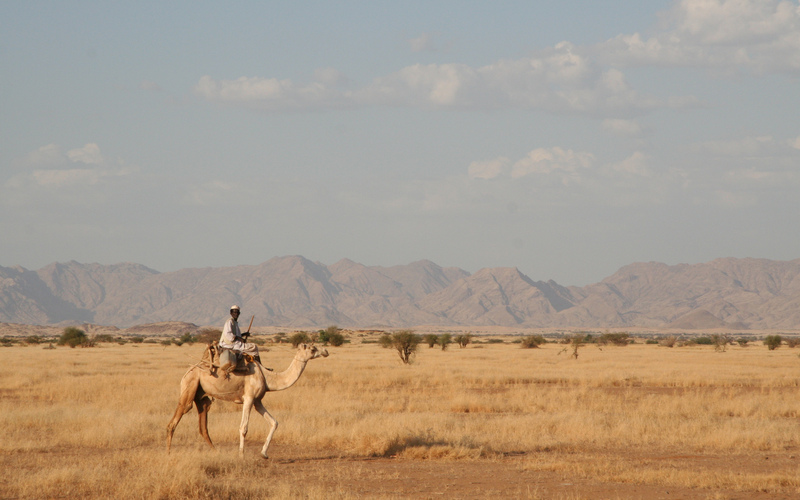 Eritrea’s current climate is quite variable, and is impacted by the Sahel-Saharan desert, the Red Sea and its various physical characteristics (MLWE, 2007). Around 70 per cent of the country is characterized as hot and arid, receiving an annual rainfall of less than 350 mm (MLWE, 2007). The country is comprised of six agro-ecological zones that experience two rainfall seasons: the summer rains of July and August which affect the central highland and western lowlands (representing more than 70 per cent of annual rainfalls); and the winter rains of November to March which impact coastal areas and the eastern and southern regions (MA, 2010; MLWE, 2007). Rainfall in the country is characterized by considerable variability within and between years, as well as spatial variation over extremely short distances (MLWE, 2007). In terms of the anticipated impacts of climate change, Eritrea is anticipated to experience temperature increases above the global average, with rises of 1.1 to 3.8°C by the 2060s, and 1.6-5.4°C by the 2090s (MA, 2010). All available projections suggest the country will experience a considerable increase in the number of hot days and nights compared to its current climate (MA, 2010). What is less clear are the potential changes in precipitation that the country will experience. In this regard, projections range from -13 to +19 mm per month (-30 to +62 per cent change) by the 2090s depending on the models used (MA, 2010). These predictions are made more difficult given that annual rains in Eritrea are heavily influenced by the Inter‐Tropical Convergence Zone, a narrow belt of low pressure and heavy precipitation that forms near the equator and varies in position year to year (McSweeney et al., 2010). Understanding of how this zone will move as the climate changes is limited. While uncertainty around changes in precipitation persists, there is general agreement that the country will experience more frequent droughts (MA, 2010). In its First National Communication to the United Nations Framework Convention on Climate Change (UNFCCC), Eritrea notes its vulnerability to these projected changes given its limited adaptive capacity (MLWE, 2001). The country further is made vulnerable by its current state of land degradation, driven in part by deforestation; a century ago, 30 per cent of the country was forested, whereas less than 1 per cent remained in 1995 (MA, 2010). Though its National Adaptation Programme of Action (NAPA), Eritrea has identified the following key climate hazards: increased climate variability, recurring droughts, flash flooding and sea level rise. The most vulnerable groups are those that depend on natural resources for their livelihoods, including rural dwellers, subsistence farmers, the urban poor, pastoralists, fishermen and island residents (MLWE, 2007). Given the project climatic changes, agriculture has been identified by Eritrea as its most vulnerable sector (MLWE, 2007). Reflecting the uncertainty in the projected changes in rainfall in the country, the impacts of climate change on the agriculture sector are unclear. Regional climate models foresee a 5 to 20 per cent gain in the length of growing period (LGP) in the highlands of the country, whereas another source indicates the majority of the country’s population will experience moderate to large losses in LGP by 2050 (ILRI, 2009). The country’s main crops, sorghum and potatoes, are grown in areas where a sharp drop in LGP is anticipated (ILRI, 2009). The National Communication indicates that climate change will have a variable impact on grain yields in the country; while sorghum (46 per cent of cereal production in country) is anticipated to increase, barley (15 per cent of current cereal production) is anticipated to decrease (MLWE, 2001). Changes in the country’s LGP could further compound an already unstable food security situation (MA, 2010). 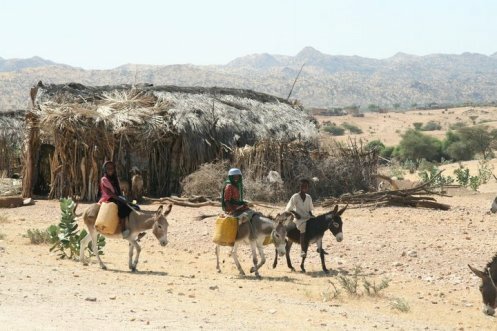 Eritrea’s National Communication suggests the following measures to adapt to climate change in the agricultural sector: a policy framework; sustainable use of the natural resource base on which agriculture depends; improvement of existing crops, technologies and traditional knowledge systems; education of the public; construction of early warning system; linkage with regional and international networks; and coordination mechanism to enable stakeholders to participate in efforts to adapt to climate change. Eritrea’s NAPA identifies number of priority adaptation projects to accelerate adaptation in the country, as listed in Table 3. Barriers mentioned to implementation of NAPA activities include: institutional coordination; human resource capacity; lack of regional and/or micro policies for various socioeconomic sectors; funding; and lack of clear institutional mandates. Eritrea has prepared both a NAPA and National Communication under the UNFCCC, providing it with an understanding of the risk and priority needs related to adaptation. It has also released a National Environment Management Plan that outlines the country’s broader environmental policy; however, adaptation is not explicitly mentioned in this policy. There are a very low number of adaptation projects underway in Eritrea relative to other East African countries, as listed in Table 2. The country’s two nationally-focused project are, however, quite significant. One is funded by the Least Developed Countries Fund (LDCF) and addresses adaptation in the livestock sector. It aims to improve livestock management practices, technical capacities, and develop lessons learned around adaptive livestock management practices. This project responds to a key adaptation priority identified in the country’s NAPA. The second project is being supported by the Adaptation Fund. 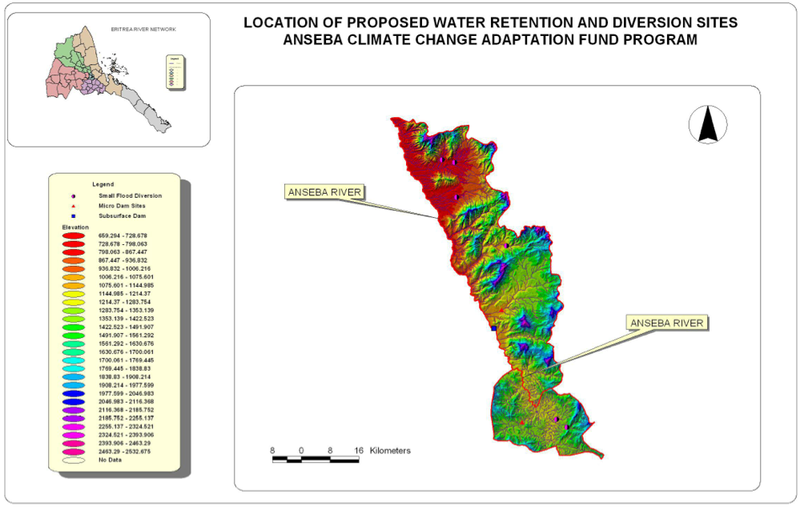 It focused on freshwater and agriculture in the Anseba Region. The overall objective of the project would to be to promote increased food security in Eritrea through climate-resilient improvements in agricultural production.110 With respect to multi-country initiatives, Eritrea is participating in an Africa-wide project, “Great Green Wall”, which addressed desertification and food security through the creation of a biological through participating countries. It is also participating in a regional project funded by the Climate Change Adaptation in Africa program focused on adaptive capacity in the small-scale agriculture sector. Eritrea’s NAPA describes five priority adaptation actions in the agriculture, forestry and water sectors. The objectives of the first project described below—rangeland management improvements in lowland areas—are being addressed through an active project funded by the LDCF. The remainder of the proposed projects focus on community-based adaptation, capacity building, and field implementation activities within the areas of pastoralism, forestry, water, and agriculture. Eritrea’s current adaptation actions are focused on the agricultural sector, noted by the country’s NAPA and National Communication as one of its most vulnerable areas to climate change. There is still a need to address a broader range of adaptation issues in the country, including those related to water resources management as well as reforestation. As discussed in the NAPA, it is possible that certain barriers to implementation may be interfering with the advancement of adaptation in the country. Going forward, Eritrea may consider investing in meteorological and climate modeling research so as to better anticipate the country’s range of climate risks. Given that the country is already experiencing climate conditions that mirror the anticipated effects of climate change (such as prolonged droughts, shifts in precipitation, etc. ), it may be worthwhile to research current indigenous adaptive responses in order to highlight lessons learned and/or capacity building needs. Further, there are no projects focused primarily on gender and climate change, nor on the impacts of climate change on human health. Hove, Hilary; Echeverría, Daniella; Parry, Jo-Ellen. (2011) “Review of Current and Planned Adaptation Action: East Africa.” Adaptation Partnership / International Institute for Sustainable Development. Eritrea has special needs regarding adaptation to climate change. Through improved capacity building and project identification, government agencies and other actors will increase their abilities to insulate at risk urban and rural populations from the adverse effects of climate change. Eritrea is located at the northern part of the Horn of Africa; Eritrea shares a border with Sudan, Ethiopia and Djibouti and has a landmass area of, about 125,700 km2 inclusive of the islands, and a coastline spanning some 1,720 kilometers. Eritrea is amongst the poorest countries in the world, confirmed by its Human Development Index rank of 157 from 177 countries. Approximately 3.5 million people reside in Eritrea, with the majority of the population living in the cooler areas of the central highlands (MLWE, 2007). Its terrain extends from highlands in the country’s central and northern regions, to flat coastal plains in the eastern lowlands, and to flat plains of the western lowlands (MLWE, 2007). Eritrea also has jurisdiction over about 300 islands located in the Red Sea. No rivers flow throughout the year in Eritrea (USDS, 2011). Two-thirds of the 3.66 million population live in rural and semi-rural areas. Approximately 80 per cent of the population lives in rural areas and depends on subsistence rain-fed agriculture for their livelihoods, including both crop production and livestock (MLWE, 2007). Agriculture, fisheries, industries, tourism and mining are important parts of the country’s economy (MLWE, 2007). In 2007, agriculture accounted for 21 per cent of Gross Domestic Product (GDP); industry accounted for 22 per cent of GDP, and the service sector 58 per cent (MLWE, 2007). With a level of Gross National Income of US$640 per capita107 (USDS, 2011), Eritrea is considered to be amount the least developed countries in the world. Eritrea is one of the most food insecure countries in sub-Saharan Africa and has one of the highest rates of malnutrition; the country also imports roughly half of the food required to meet basic needs (MA, 2010). War and frequent drought, combined with population growth, have reduced food production and investment in development. Eritrea faces severe and acute vulnerability including Africa’s highest level of food insecurity and extreme malnutrition. 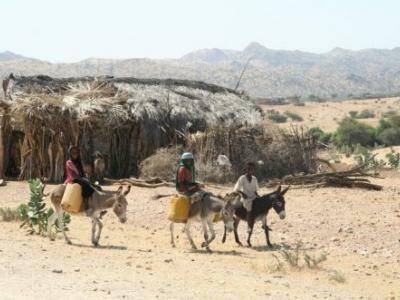 Climatic risks pose a serious challenge to Eritrea’s emerging development priorities for agricultural development, livestock raising, forestry conservation, water resource management, coastal and marine environmental protection and safeguarding public health. For each of these sectors, adaptation options have been identified on the basis of desk-based assessments through extensive stakeholder consultations, including individuals from governmental agencies, non-governmental organizations, and grass roots communities across the country. Source: Hove, Hilary; Echeverría, Daniella; Parry, Jo-Ellen. (2011) “Review of Current and Planned Adaptation Action: East Africa.” Adaptation Partnership / International Institute for Sustainable Development. This project aims to promote greater food security through ecologically sustainable and climate-resilient improvements in agricultural production. The objective of the programme is to increase community resilience and adaptive capacity to climate change through an integrated water management and agricultural development approach in the sub-regions of Hamelmalo and Habero. Stakeholders include community, civil society and government representatives. The success of this project will be felt through its status as a demonstration project, and through the development of a national climate change strategy. Farmers; Agro-pastoralists; Rural Eritreans living in the Anseba region, subzobas: Habero & Hamelmalo. This programme's objective is to increase community resilience and adaptive capacity to climate change through an integrated water management and agricultural development approach in the sub-zobas of Hamelmalo and Habero, Anseba Region, Eritrea. The programme will adopt a participatory approach working with vulnerable groups in particularly drought-prone areas of Anseba Region, including small-scale farmers, agro-pastoralists and rural women. Flood water will be harvested, water storage will be developed and soil erosion control measures and irrigation will be introduced. Climate-smart technology will be implemented, including drought-resistant and early maturing crops, by means of enhanced extension services. Rangeland management systems will be enhanced. Improved information on climate change risks will be generated and integrated into farmer and pastoralist practices. The programme will improve knowledge and understanding of climate change impacts among stakeholders, develop a community-based early warning system to reduce climate risks, and an action research approach linking traditional and scientific knowledge through the use of seasonal forecasts. The programme will additionally have a strong learning and knowledge management component to capture and disseminate lessons learned. Every effort will be made to institutionalise this within the processes of the Ministry of Agriculture at the Zoba Anseba level, the executing agency. The programme will be led by the Anseba Zoba Administration, working with local communities in Hamelmalo and Habero sub-regions, with support and oversight by central government. Construct and introduce infrastructure and technology improvements, including a sub-surface dam within the Anseba River (Output 1.1), flood water harvesting (Output 1.2), two micro dams (Output 1.3), and soil and water conservation infrastructure (Output 1.4). Climate-resilient agricultural technologies developed and transferred to farmers, including drought- and disease-resistant varieties, crop-livestock production systems, conservation agriculture, and agroforestry (Output 2.1). Farmer-led collaborative action learning process developed to enhance adaptive capacity and utilize seasonal forecasts (Output 2.2). Improved climate risk information and monitoring capacities developed (Output 3.1) and disseminated through awareness-raising (Output 3.2) and community-based early warning system (Output 3.3). Knowledge management system established and knowledge management activities implemented (Output 4.1), along with policy advocacy activities (Output 4.2). Programme start: A Programme Initiation Workshop will be held within the first 2 months of programme start with those with assigned roles in the programme organization structure, UNDP country office and where appropriate/feasible regional technical policy and programme advisors as well as other stakeholders. The Initiation Workshop is crucial to building ownership for the programme results and to plan the first year annual work plan. Quarterly: Progress made shall be monitored in the UNDP Enhanced Results Based Management Platform. Based on the initial risk analysis submitted, the risk log shall be regularly updated in ATLAS. Annually: An Annual Project Review/Project Implementation Reports (APR/PIR) is prepared to monitor progress made since project start and in particular for the previous reporting period (30 June to 1 July). The APR/PIR combines both UNDP and SOF (e.g. GEF) reporting requirements. Periodic Monitoring through site visits: UNDP CO and the UNDP RCU will conduct visits to programme sites based on the agreed schedule in the programme's Inception Report/Annual Work Plan to assess first hand programme progress. Other members of the Programme Board may also join these visits. A Field Visit Report/BTOR will be prepared by the CO and UNDP RCU and will be circulated no less than one month after the visit to the programme team and Programme Board members. Mid-term of programme cycle: The programme will undergo an independent Mid-Term Evaluation at the mid-point of programme implementation (insert date). The Mid-Term Evaluation will determine progress being made toward the achievement of outcomes and will identify course correction if needed. It will focus on the effectiveness, efficiency and timeliness of programme implementation; will highlight issues requiring decisions and actions; and will present initial lessons learned about programme design, implementation and management. Findings of this review will be incorporated as recommendations for enhanced implementation during the final half of the programme‘s term. End of Programme: An independent Final Evaluation will take place three months prior to the final Programme Board meeting and will be undertaken in accordance with UNDP and SOF (e.g. GEF) guidance. The final evaluation will focus on the delivery of the programme‘s results as initially planned (and as corrected after the mid-term evaluation, if any such correction took place). The final evaluation will look at impact and sustainability of results, including the contribution to capacity development and the achievement of global environmental benefits/goals. During the last three months, the programme team will prepare the Project Terminal Report. This comprehensive report will summarize the results achieved (objectives, outcomes, outputs), lessons learned, problems met and areas where results may not have been achieved. It will also lay out recommendations for any further steps that may need to be taken to ensure sustainability and replicability of the programme‘s results. Learning and knowledge sharing: Results from the programme will be disseminated within and beyond the programme intervention zone through existing information sharing networks and forums. The programme will identify and participate, as relevant and appropriate, in scientific, policy-based and/or any other networks, which may be of benefit to programme implementation though lessons learned. The programme will identify, analyze, and share lessons learned that might be beneficial in the design and implementation of similar future programmes. Finally, there will be a two-way flow of information between this programme and other projects of a similar focus.